Our Functionally Fluent! system is based on the principle that the more functions you can perform in Spanish - in other words, the more you can do in a language - the closer you are to being functionally fluent. 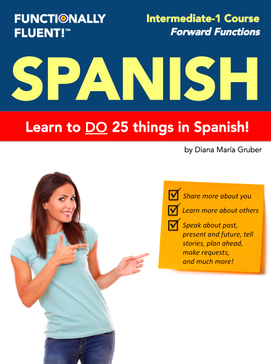 To achieve this goal, in each of HABLA's levels you'll learn to do at least 25 things in Spanish! 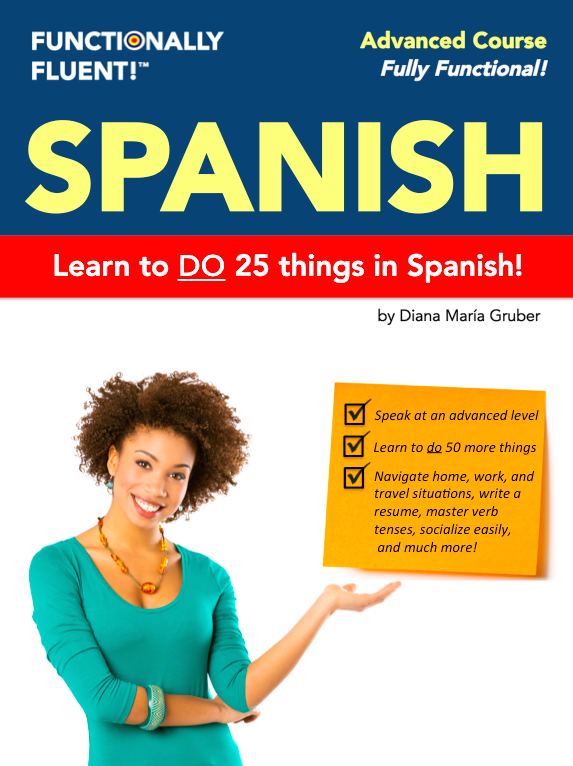 After completing all five levels - Beginners through Advanced - you'll know how to do at least 125 things in Spanish, making you functionally fluent! 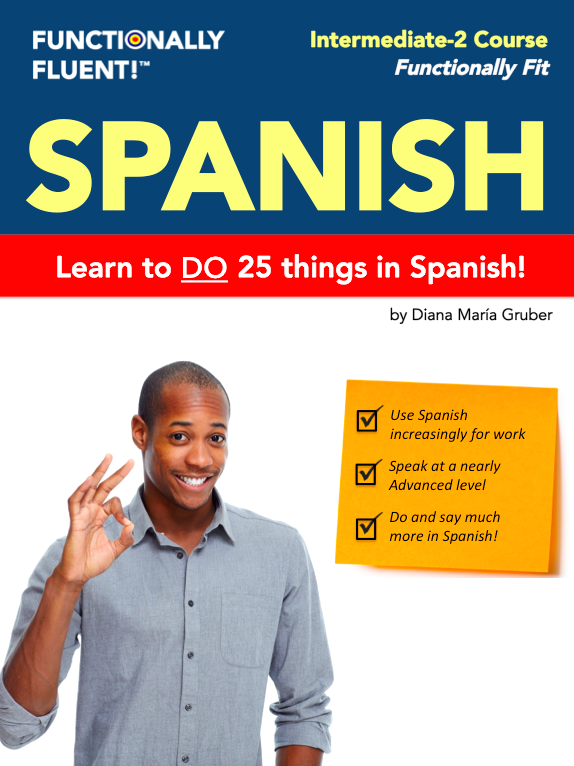 Each level covers 14 hours of Spanish class instruction and includes one textbook. 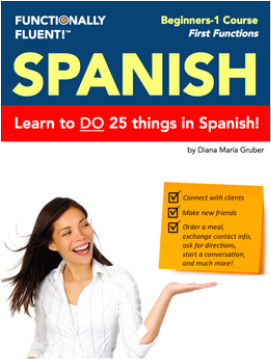 Weekend intensive classes include 24 hours of Spanish class instruction and cover two books. Not sure of your level? Read these descriptions or test yourself! Beginners-1 helps you learn the basics and build on them! 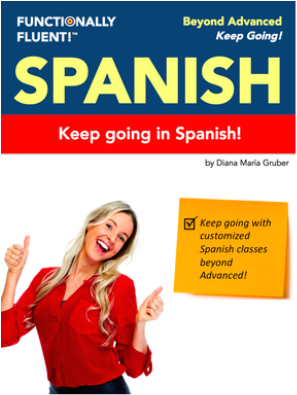 Recommended if you've never studied Spanish or studied many years ago and need to start afresh! In this level, you'll learn to talk about yourself, ask questions, start conversations, exchange contact details, and much more. Learn vocab for work, home, friends, family, places, food, and more. Grammar includes question forms and present tense singular forms of many verbs. Basic work-related vocab may be introduced, depending on class needs. Not sure of your level? Test yourself! ﻿﻿﻿﻿﻿Beginners-2 takes you beyond the basics, towards becoming Intermediate. Recommended if you can have a 2-3 minute conversation in Spanish, but not much more. Expand on basic dialogs, increase your vocab, and learn to keep a conversation going in Spanish! Review and learn vocab for work, home, friends, family, places, food, time, weather, travel, habits, cultural customs, and more. Grammar includes singular and plural present tense forms, questions, regular and irregular verbs, and more. ﻿﻿﻿﻿﻿Intermediate-1 means you're halfway to functional fluency! Recommended for students who can speak in the present, but struggle with other verb forms, whether you remember them from past courses, or have never learned them. Learn to speak about an array of topics, including present habits, past events and experiences, and future plans. Vocab focuses increasingly on specific needs at work and in your life. 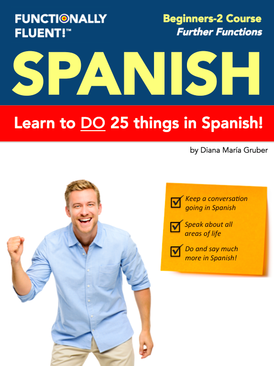 Build confidence as you speak entirely in Spanish during class. An exciting turning-point on your path to fluency! ﻿﻿As an Intermediate-2 student, you are almost advanced - so close to being functionally fluent! You'll express yourself entirely in Spanish in an increasing variety of situations - at home, around town and at work. Conversations are richer, flow more easily, and carried on for sustained periods. Grammar include all major past, present and future tenses and their nuances. Increasing work focus may be added, since students can handle this type of specificity. This is a class for "strong" learners as you move towards Advanced. REGISTER NOW FOR An ​intermediate-2 CLASS! ﻿Congratulations! Your level is Advanced, and soon you'll be functionally fluent in Spanish! This means your Spanish flows. You readily use a variety of language structures - past, present, future verb tenses, complex terms, idioms and more. Your Spanish is not perfect, and you still make some mistakes, but you know you can function in all situations - at work, while traveling, and in life in general. Your efforts speaking, listening, reading and writing in Spanish have paid off. You even think in Spanish. Spanish has become second-nature to you. You can confidently say: "¡Hablo español!" Instead, it represents the opportunity for a tailored class, created in partnership with HABLA for our corporate clients and current groups of HABLA students wanting to go beyond Advanced. Customized Beyond Advanced courses may use our Functionally Fluent! Advanced book and materials provided by the teacher, HABLA, or students. This may include articles, videos and audio, and job-specific supplements for Spanish for Lawyers, Spanish for Business, and others.